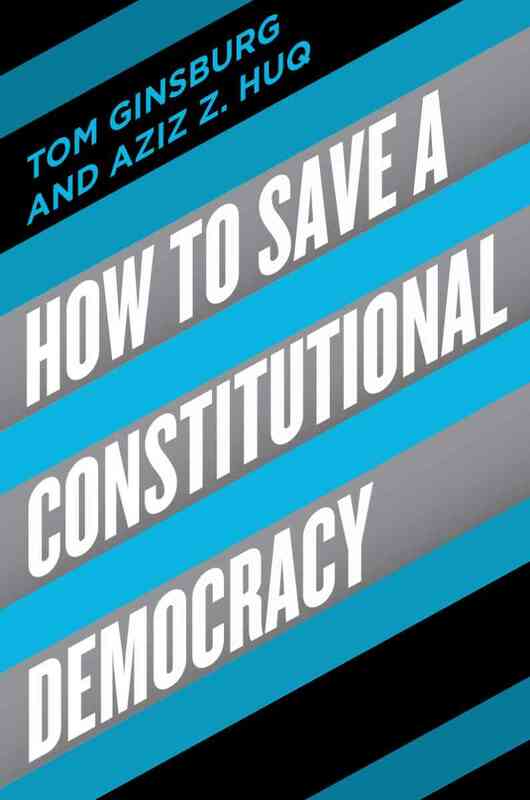 Tom Ginsburg and Aziz Huq discuss How to Save a Constitutional Democracy. They will be joined in conversation by William Howell. A Q&A and signing will follow the event. About the book: Democracies are in danger. Around the world, a rising wave of populist leaders threatens to erode the core structures of democratic self rule. In the United States, the election of Donald Trump marked a decisive turning point for many. What kind of president calls the news media the “enemy of the American people,” or sees a moral equivalence between violent neo-Nazi protesters in paramilitary formation and residents of a college town defending the racial and ethnic diversity of their homes? Yet, whatever our concerns about the current president, we can be assured that the Constitution offers safeguards to protect against lasting damage—or can we? About the authors: Tom Ginsburg is the Leo Spitz Professor of International Law at the University of Chicago, where he also holds an appointment in the Political Science Department. He holds B.A., J.D. and Ph.D. degrees from the University of California at Berkeley. He currently co-directs the Comparative Constitutions Project, an NSF-funded data set cataloging the world’s constitutions since 1789, and is the author or editor of over 20 books, including Judicial Reputation: A Comparative Theory (2015) (with Nuno Garoupa) and The Endurance of National Constitutions (2009) (with Zachary Elkins and James Melton). He currently serves a senior advisor on Constitution Building to International IDEA. Aziz Huq is the Frank and Bernice J. Greenberg Professor of Law at the University of Chicago Law School, where he teaches and writes on constitutional law, national security law, and criminal procedure. He is a cooperating counsel with Muslim Advocates and the ACLU of Illinois on challenges to discriminatory policing and immigration policies. Before starting teaching, he clerked for Justice Ruth Bader Ginsburg, ran the Brennan Center’s Liberty and National Security project, and worked for the International Crisis Group in South Asia and Afghanistan. About the interlocutor: William Howell is the Sydney Stein Professor in American Politics at the University of Chicago Harris School of Public Policy and a professor in the Department of Political Science and the College. He has written widely on separation-of-powers issues and American political institutions, especially the presidency. He currently is working on research projects on Obama's education initiatives, distributive politics, and the normative foundations of executive power. Howell is the author, most recently, of Relic: How Our Constitution Undermines Effective Government—and Why We Need a More Powerful Presidency (Basic Books, 2016). He is also the author, with Saul Jackman and Jon Rogowski, of The Wartime President: Executive Influence and the Nationalizing Politics of Threat (University of Chicago Press, 2013), and, with David Brent, Thinking about the Presidency: The Primacy of Power (Princeton University Press, 2013).